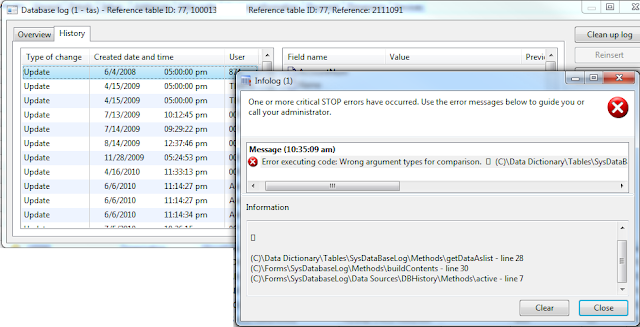 Alex on DAX (Alex Kwitny): Database log throws error "Error executing code: Wrong argument types for comparison." 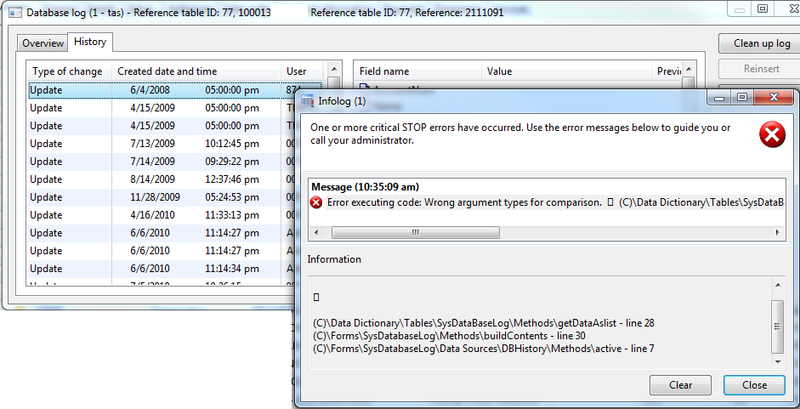 Database log throws error "Error executing code: Wrong argument types for comparison." So we have had our database log turned on since AX 3.0, and we've upgraded to AX 4.0, then AX 2009. An ongoing issue has been with the database log throwing "Wrong argument types for comparison", and I've finally gotten around to diagnosing it, and it seems like it could be a very common issue caused by an upgrade. The actual issue is this, when we were in AX 3.0, we made a chance to a record, which was logged to Tables\SysDatabaseLog and had the ModifiedDate stored as a type of Date. Somewhere along the AX 3.0 to AX 4.0 to AX 2009, this data wasn't upgraded properly. When the database log compare form tries to work with it, it's expecting to work with two utcDateTime objects for comparison, but it gets a Date and fails. I just had a case where I got a string value (Customer or Vendor ID) in the log for a custom float field on InventTable. AX 2009 from the start, apparently you don't need to upgrade to get corrupt data in DatabaseLog. That's strange. I'd guess you might have had added a custom string field to a table, typed some data, then changed the string field to a float. You would receive a synchronization warning that says "Warning this field will be dropped and recreated" or something to that sort. All is well, except that if you had DB logging turned on, that string field was recorded in the DB log, then it is now a float and it is a type mismatch. This would explain your error, but it's just my guess.